The Inky Daisy: Will you be mine? I wanted to share some valentine's I made this year. First up is the one I made for my honey. This is a rather simple card...I didn't want to make it too frou-frou-y. So, I used real red and kraft cardstock from SU! 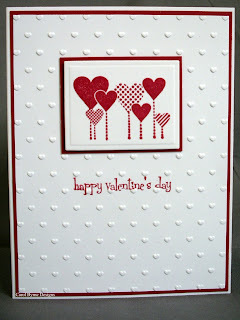 The embossed dots on the kraft are courtesy of a Quickutz embossing folder. The heart is an EK Success punch. Used a scrap of burlap...even the bow is made from a fiber pulled from the burlap. The background to the heart/burlap is a piece of corrogated box, cut into a square with red DMC floss wrapped in the valleys. I thought it was a neat effect. The stamp is a $ one from Mike's. 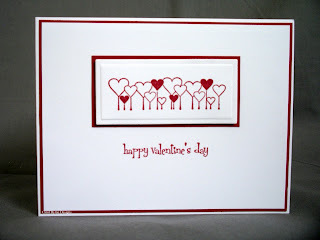 Next up is another very simple card utilizing the hearts embossing folder from Cuttlebug. I used a $ stamp from JoAnn's...isn't it just adorable? I LOVE it! The sentiment is by My Sentiments Exactly!. Cardstock is from SU! Used a Nestie rectangle around the heart image. Another card I made this year (yes, they were all quite simple) again uses SU! cardstock. Those polka dots (aren't they fun?!?!?!) 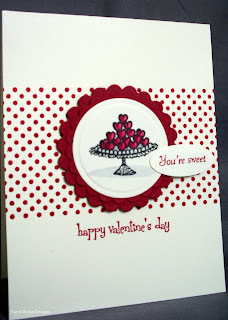 are from Impress Rubber Stamps and the Tart of Hearts is from Karen Lockhart. Colored the image with my Copics. The "you're sweet" sentiment is from a clear acrylic set from Rubber Soul and the "happy valentine's day" sentiment is again from My Sentiments Exactly!. I used a circle nestie to cut out my image and 2 sizes of scalloped nesties to double mat the image. Used my smaller oval punch from SU! for the "you're sweet" sentiment and popped it up with dimensionals. 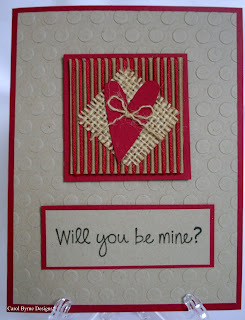 This valentine uses another JoAnn's $ stamp. Those Studio G stamps are so darn stinkin' cute this year! Again used the My Sentiments Exactly! sentiment. Used a rectangle nestie to frame the image and used SU! cardstock. So stinkin' cute! I will have to start checking out JoAnn's for these stamps! Love the little square of burlap you used, too! What a great idea for a masculine card.